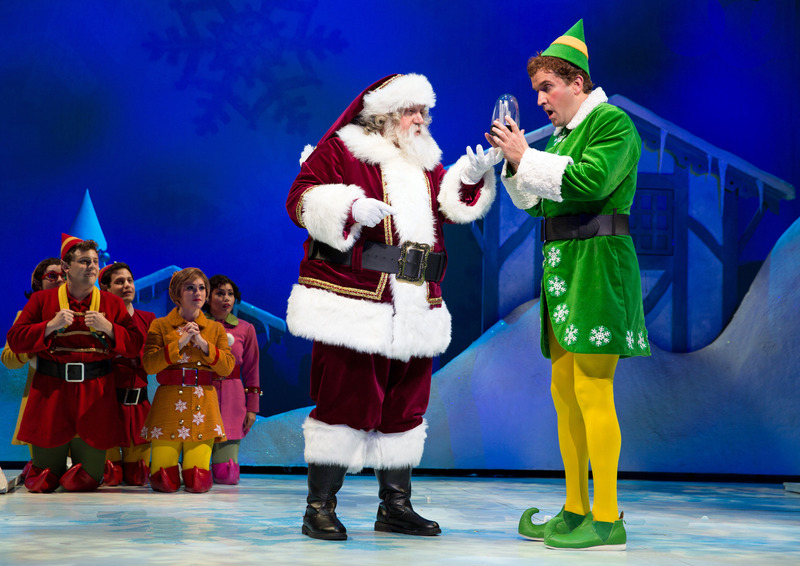 Santa (Paul C. Vogt) and Buddy (James Moye) in a scene from the Paper Mill Playhouse production of “Elf.” Michael Coale Grey is the elf far left in red./Photo by Matthew Murphy. For some lucky few, it’s who you know that gets you your dream job. But not Michael Coale Grey. It’s what he knows and how well he can deliver it that got him the job as a member of the ensemble in “Elf,” this season’s holiday offering at the Paper Mill Playhouse, Millburn, NJ. 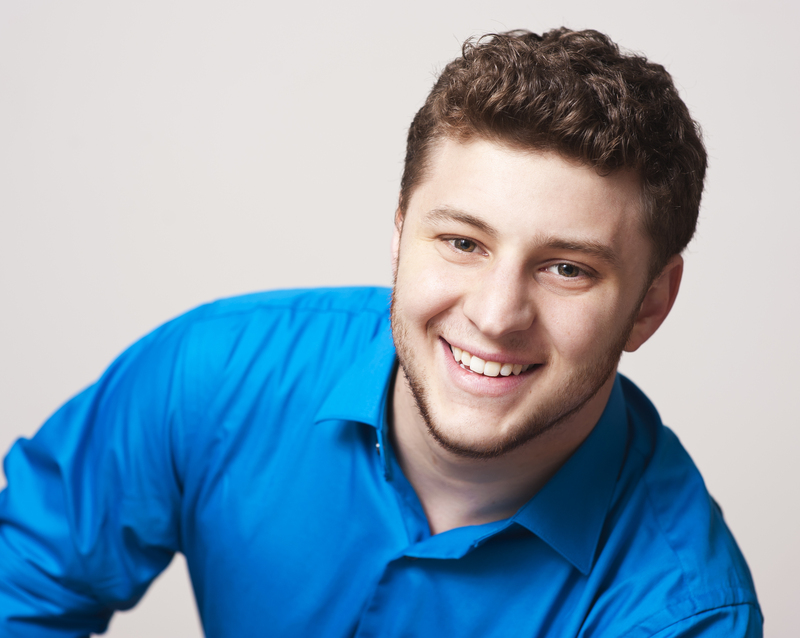 Grey, 22, spent nine years as a member of Paper Mill’s Summer Musical Theatre Conservatory — “I grew up there!” — getting to know members of the artistic staff and his way around a theater. Actor Michael Coale Grey is focused on the stage at this point in his career. “People like Patrick Parker (Paper Mill’s Associate Artistic Director) knew me and we had a good relationship, but the casting director didn’t know who I was,” Grey explains. “They don’t cast you just because you worked there when you were a kid. “I knew ‘Elf’ was on the schedule this season and that auditions were going to be late summer/early fall. I checked Playbill.com to figure out exactly when there were auditions for the open dance call. I got called back in to read, and dance again. Then a week and half later I got a call I got the job. He plays many roles in “Elf,” — including an elf, office worker, pedestrian — and has about a dozen costume changes, some of which have to be accomplished in 30 seconds. “There is definitely a whole separate show going on backstage. There’s a lot of specific tracking so we know where to be at all times. One wrong step and you can get hit by a set piece. Everyone is very good at their job and are watching out for each other and it all comes together. It’s definitely exhilarating. At the time of our telephone interview just before “Elf” opened Nov. 31, Grey had no idea what his next job would be after the show closes Jan. 4. What he does know is that he wants to do it all. Meanwhile, Grey plans to keep auditioning, auditioning, auditioning. To visit his website, click here. “Elf” is based on the 2003 film starring Will Ferrell with a book by Thomas Meehan and Bob Martin, music by Matthew Sklar and lyrics by Chad Beguelin. 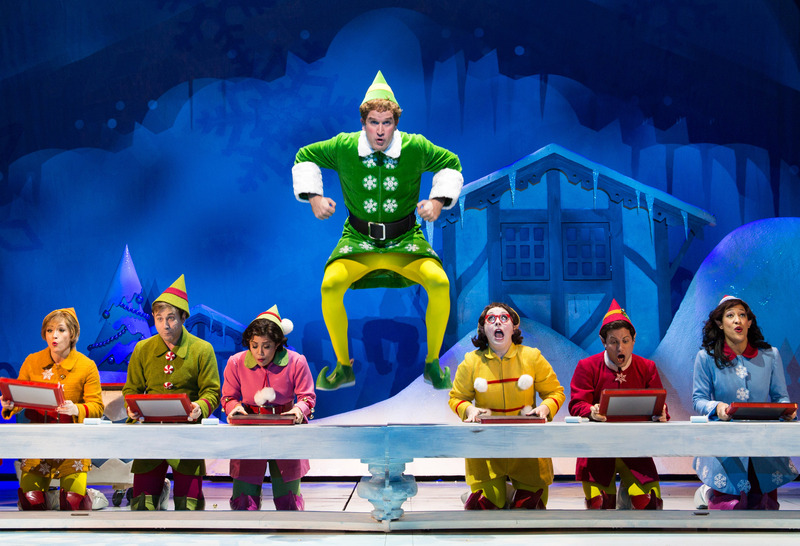 “Elf” is directed by Eric Ankrim with choreography by Josh Rhodes. The production also will feature an autism-friendly performance, coat and toy drive. The company of “Elf” (that’s Michael Coale Grey far right in blue) at the Paper Mill Playhouse, Millburn, NJ./Photo Matthew Murphy.